Whenever our family gets together and stories of old are swapped, Cathy usually requests that I tell this one. In writing the story, it loses some of its’ flavor without the sounds and hand gestures necessary to convey the full impact of what took place in our kitchen about 62 years ago. One of my best buddies and inseparable companions during our pre-teen and teenage years was Eric Richardson. We hunted, fished, camped out, water-skied, rode in Eric’s Model A, worked on my motor bike and usually spent the best part of every summer day together. Eric’s grandfather and father owned and operated Richardson Oil Company and they gave Eric and me our first summer jobs during the summer of 1955 as general handymen for the company. We probably didn’t accomplish much meaningful work, but sure had a great time and even got paid a whopping sum of 50 cents per hour! I still have the first check I ever received as an employee. It is, of course a cancelled check. 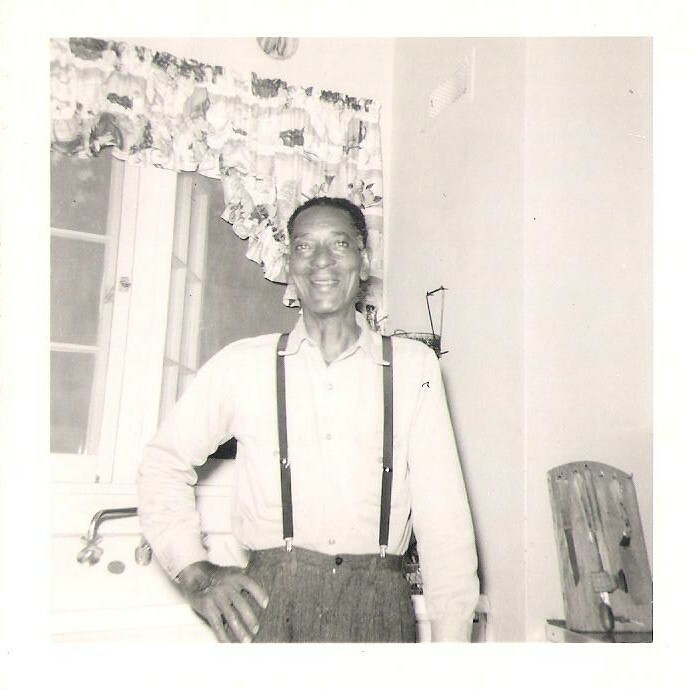 I have previously written about Brother Mose who worked for our family, and just how much I loved him. I can say for certain that Eric loved Brother Mose almost as much. We enjoyed all his funny stories and songs and loved teasing him about his snaggle-tooth, of which he took no offense. When we had a little extra money, we would buy a cigarette or two from Brother Mose for a nickel or a dime. That was an exorbitant price to pay because a pack of cigarettes at that time sold for 25 cents, but we dare not go to the store to buy a pack, because the store owner would surely tell our parents. We knew our secret stayed with him, partly because it was profitable for him, but more importantly he didn’t want us to get into trouble. During one short period of time, Pop had hired a cook and housekeeper named Ollie. I don’t know who recommended her, but she undoubtedly was very efficient and was also a pretty good cook. Ollie was slender in build, quick in her movements and short-tempered in nature, especially with Brother Mose. She couldn’t seem to tolerate his slow but steady pace while working and seemed to think that he must be lazy and not very bright. The little songs he was always singing or humming must have added to her impression that Brother Mose would try to get by with as little work as possible. If for no other reason than she didn’t like my pal Brother Mose, I didn’t care much for Ollie. She usually didn’t have time to talk with me and would answer any questions I had for her with either a short yes or no. She was more interested in getting her work done than in having a relationship with me or with any of my friends. I suppose that was a good thing for Pop and Mom, but Ollie just wasn’t much fun for us. One day when Eric was at our house, and we happened to be near the kitchen, we overheard Ollie open the back door and with a loud voice call out to Brother Mose who was quite a distance away in the back yard, “Mose, get yo’ lazy self up here in this kitchen and sweep and mop it right now like Miz Mo’ has told you.” Mose responded in his usual slow and polite manner, “Yes’um, I’ll be right there in jes’ a minute.” Eric and I couldn’t stand hearing her mean voice and seeing her attitude toward our pal, and Eric started by saying, “Ollie, did you know that Old Mose has epilepsy, and when someone yells at him and threatens him, he sometimes has a seizure?” I picked up on this spontaneous (but untrue) story by saying, “When Mose has a seizure, he doesn’t know what he is doing, and he gets violent and strikes out at the closest one to him.” As I was talking, Eric spotted the meat cleaver that always hung in the kitchen by the sink and continued to enlarge on our concocted story. He said with a straight face, “Once when a housekeeper in this very kitchen yelled at Mose, he suddenly had a seizure and grabbed that cleaver right there and buried it in the center of her forehead right between her eyes! She died right where you are standing.” Ollie said she didn’t believe this story and asked, “If he killed that lady why didn’t he go to prison?” We said that Pop loved Brother Mose, and when he got to the house, he testified that the woman died of a heart attack and he signed that on the death certificate so there was no investigation. Ollie said, “You two boys are just telling a big story that ain’t true, and I ain’t got time to listen to no more of yo’ lies.” We both said she had better listen and keep a close eye on Brother Mose. The trap had been set in her mind, but we needed to let Brother Mose in on the scheme. Eric and I slowly made our way to the back part of our large backyard where Mose was raking leaves, and we asked him if he would like to make an easy 50 cents? “I shore would. What are you two boys up to?” We told him all he had to do was when he went into the kitchen and Ollie started fussing and complaining to him, he needed to grab the meat cleaver and act like he was going to use it on her. He said he could do that and Eric and I each gave him a quarter. Within 5 minutes, Brother Mose made his way into the kitchen where Ollie was working at the sink with her back to the door. As soon as Mose entered the room, Ollie began her usual tirade, “I don’t know why you took so long getting here, and you ain’t done what Miz Mo’ told you. Where you been all this time? You know what you supposed to do.” As she turned around to face Mose, he had the cleaver in his hand and according to him, all he did then was show it to her and say, “Here’s what I’m gona’ do!” Mose said that her reaction was instant as she squatted down with both hands raised into the air as if she was about to receive a deadly blow to her forehead. She screamed out, “Ohhh Lawd Jesus, hep me.” She then burst out of the back door in a dead run and ran half-way up our long driveway before she stopped. As Eric and I heard the commotion and came into the kitchen, Brother Mose was doubled over, hold his sides in laughter. He said that Ollie had “run off.” Eric and I went quickly up the driveway to tell Ollie it was all a big joke, and Mose wouldn’t ever hurt her, so it was safe for her to return to the kitchen. We were afraid she was going to report us to Pop, or even worse, to the police. Ollie never fussed or complained to Brother Mose following this incident, but I don’t think she ever truly trusted him. I believe she kept her eyes on him not knowing whether he might really have epilepsy, or some other strange malady. Within a month or so, she turned in her resignation to Pop saying she had gotten another job. None of us were particularly sad she was gone, and I never told Pop this story. If I had told him, I think he would have had a big laugh over it, and especially the part about the death certificate. This is a classic!!! May I print it out and share it with Eric? He lives just across the alley from me on the corner of Euclid and 8th. My great uncle OB in Strong had a really good housekeeper but she did go after her “live in” husband with a knife. Went to prison for murder until my great aunt Clothielde plead her case before the prison board. Yes, she killed a man but she was a good housekeeper and good ones were hard to come by in Strong, Arkansas. So, Wilma was remanded to Clothielde’s custody. Not Sheriff A Peroni, the town marshal or even OB. Eric will get a kick out of the story. We have recounted it many times since then. He may add a few more details, but he and I had lots of fun with Brother Mose over the years. The Richardson family had a wonderful man named Norman Barnes that worked for them for years. “Barnes” as we called him, could spin some tales which Eric might share with you. Thanks for encouraging my writing Todd. You are a great friend to Cathy and me. This is one of my favorite stories!! Oh, how I wish we could have known Brother Mose! I’ve told you so many stories about him, you do know him. You, Ginny and John would have been able to get him to teach you all his songs and even the Hambone like he taught me! You can see from his countenance in the photos, that he was always fun!